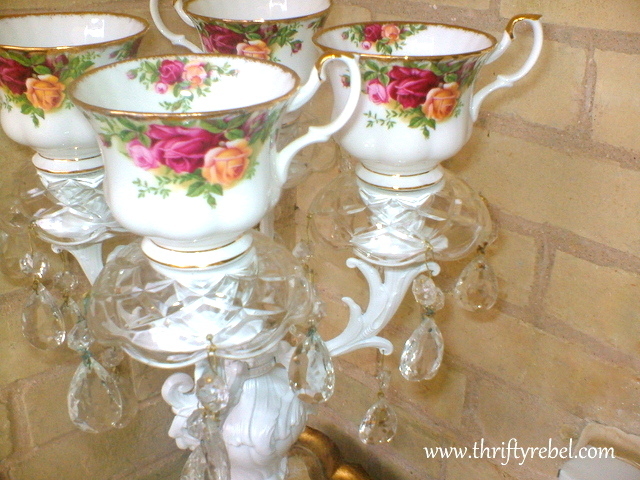 It’s very easy to make an elegant teacup candelabra. I made this one last year and just found the pics as I was going through some files… and I realized that I never posted it. 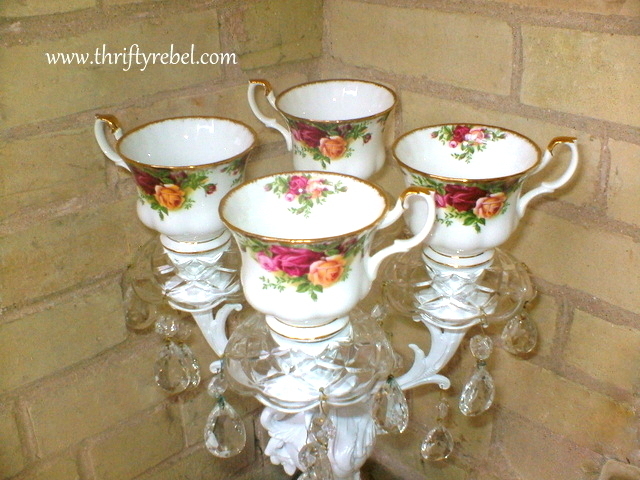 The hardest part about this teacup candelabra project was finding the pieces to put it together. 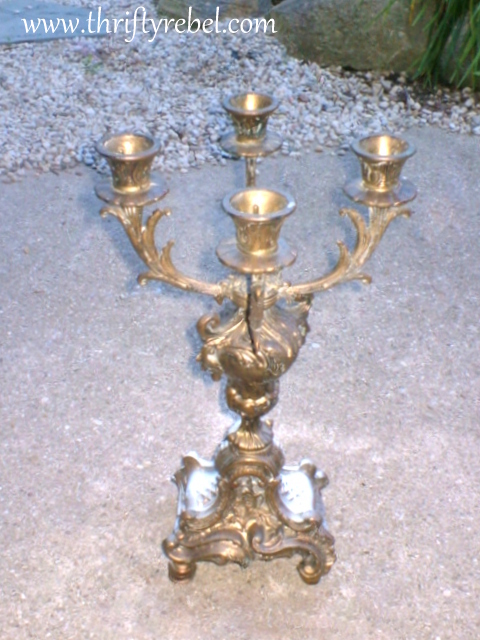 I shared this thrifted vintage candelabra in a thrifted finds post a couple of years ago. I gave it two coats of white spray paint love using Krylon white dual paint and primer combo. Then, using Marine GOOP adhesive, I simply glued on some glass chandelier bowls from my stash, added some glass chandelier crystals, and glued on the teacups. Now don’t freak out on me, but these are Royal Albert Old Country Roses teacups. You could of course use mismatched teacups too, whatever you like really. 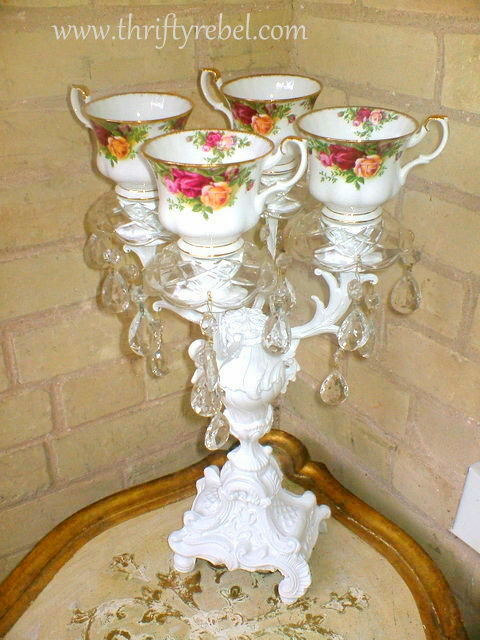 And there you have it… an easy to put together teacup candelabra. And it cost me about $10. You could use tealights or if you have glass candle holders that are small enough to fit inside the teacups regular candles could also be used, but not in my house of 4 cats. I love the look of teacups, but I never use them… I’m a mug girl myself. So for me it’s OK to love them as a candelabra rather than letting them sit in my china cabinet while they collect dust. Oh how I hate dusting. lol. The important thing is that they are being enjoyed for their beauty. For other teacup projects check out my teacup lampshade, and my garden candelier. I love it I’ve actually been planning to do one with a chandelier I have. I couldn’t use royal Albert i just couldn’t but it sure looks pretty. Thanks Mel! Using those teacups didn’t hurt a bit, lol,, but I totally understand that not everyone could do it. It is beautiful! I think this is a perfect way to use precious items that would otherwise collect dust. Thanks AnnMarie! I’m all about using things these days, rather than just looking at them. Although there’s nothing wrong with just looking at them if that’s what brings someone joy. Love this. I have been wanting to do something like this for quite sometime but just haven’t found the right candle holder/chandelier. I see this sitting in the center of a dining room table filled with mints or other assorted candies. 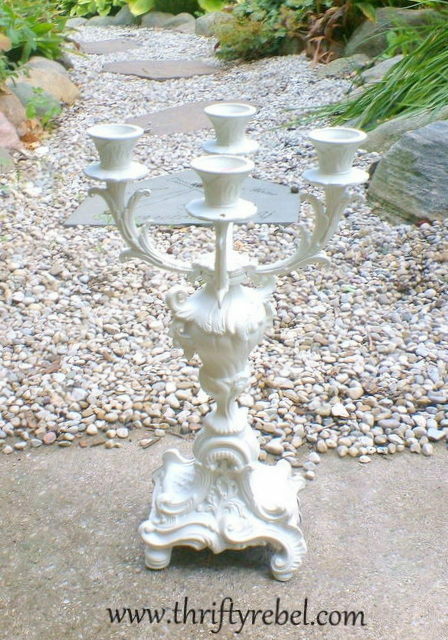 What great ideas for this candelabra Colleen. I’ve been doing more indoor decorating for Christmas the last few years, and I enjoyed using it last season. I hope you find one that you love. Thanks Dona. Oh I can relate to that. I got rid of quite the collection a bunch of years ago, but thrift stores around here are always full of them so it’s easy to get my hands on more. I hope you find some. How gorgeous, Tuula! You know I love tea cups so this is something I would enjoy having in my home 🙂 I am going to be on the lookout for just tea cups at the antique stores. Thanks for sharing another delightful idea. Hugs! Thanks Stephanie! This is a great way to use teacups that have lost their saucers. Often they’ll be less expensive that way too. Happy teacup hunting! Ahhhhhhhh so sweet and pretty. Great creative treasure Tuula. Thanks so much Kris! And it only took me a year to post it. lol. Thanks so much Cindy. I love a quick and easy project. I love it! It would be great for a wedding table. Thanks Kirby! I can see this at a wedding table. Maybe hubby and I will have to renew our vows someday just so we can use it. lol. That is so lovely! You have such great ideas using tea cups. Thanks so much Donna! I have a real love for teacups, except to drink out of them. lol. Old Country Roses are my favorite. Your candelabra looks beautiful! I need to start using the patterns I love, I don’t know what I am saving them for! Thank for all the lovely projects you share. Thanks Debra! That’s exactly how I feel. I want to use and enjoy the things I have right now. This is adorable! Love those gorgeous teacups! Thanks so much Patti! The beauty of the teacups did most of the work for me. Now I get to appreciate them even more. Thanks Cecilia! I love repurposing teacups. They’re so plentiful here at the thrift stores and they can be used in so many ways. I’m still enjoying my garden candelier. Thanks so much for stopping by. I hope you have a wonderful weekend too. This is beautiful. Do the chandelier bowls come pre-drilled, or did you have to do that yourself? If so, can you explain the process? Thanks Marueen! Thankfully the chandelier bowls came with the holes already in them where crystals would have been hanging originally. There was no drilling required. Whenever I see an old broken down chandy at a yard sale or thrift store I buy it if it’s a good price. Even if the main part of the chandy isn’t usable often there are great parts that can be repurposed like these glass bowls. Beautiful, such a great idea and way to really enjoy the cups!! Thanks Connie! I love them even more now. Dearest Tuula, I am thrilled to see you shared this with Roses of Inspiration. Your candelabra is so beautiful! Hugs t o you, sweet friend! Thanks so much Stephanie! It’s always a pleasure to join the party. I love this transformation! I’d much rather see your teacups being used like this instead of sitting in a cabinet collecting dust. Great job! Thanks for sharing at Vintage Inspiration Party. It’s very beautiful Tuula! I can also see it being used outdoors as a bird feeder. Not with those gorgeous teacups of course. Thanks for sharing with SYC. Did you happen to find out the name of this pattern? Someone suggested it was Royal Albert, but I couldn’t find anything on it. Love the lampshade!! Thanks Lisa! The china pattern is Royal Albert County Roses.